VENUE: Kontaktraum, Gußhausstraße 25 – 27, Floor 6. The second recipient of the Helmut Veith Stipend for female Master´s Students is Hanna Elif Lachnitt. 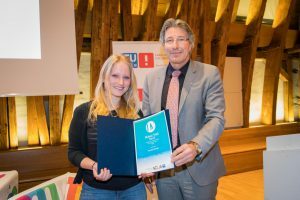 Hanna Lachnitt was presented with the Helmut Veith Stipend by the Vice Rector for Academic Affairs of TU Wien Kurt Matyas at the award ceremony on Friday, April 06, 2018. For more information and photo gallery click here. The award of 6000 EUR annualy, for up to 2 years. Application for Helmut Veith Stipend 2018/2019 is open. Download the flyer here. 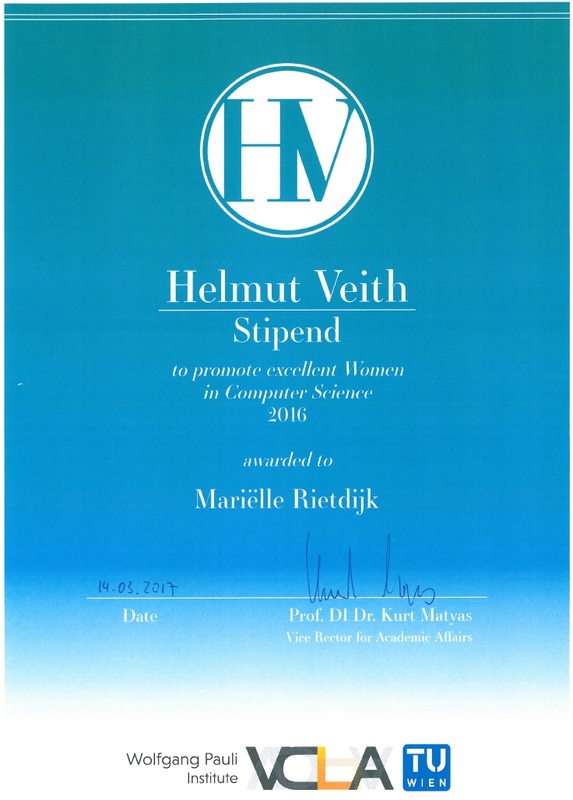 The first recipient of the Helmut Veith stipend is Mariëlle Rietdijk, and the stipend was presented to her on the 14th of March 2017 at 5:30 pm, in the Kuppelsaal of TU Wien. The first recipient of the Helmut Veith Stipend, came to Vienna from the Netherlands. She holds bachelor’s degrees in Artificial Intelligence from Utrecht University and pursues a European Master’s degree in Computational Logic at TU Wien. Video footage and/or photos will be taken during this event, which may or may not include your recognizable image. Please be advised, by participating in this event, you agree to allow TU Wien to use the images in print, digital or web-based formats for promotional, sponsoring and archival purposes. If you do not wish to have us use your image, please notify the event organizer. Während dieser Veranstaltung werden Videomaterial und / oder Fotos aufgenommen, die Ihr erkennbares Bild enthalten können. Bitte beachten Sie, dass Sie mit der Teilnahme an dieser Veranstaltung der TU Wien erlauben, die Bilder in Print-, digitalen oder webbasierten Formaten zu Werbe-, Sponsoring- und Archivierungszwecken zu verwenden. Wenn Sie nicht möchten, dass wir Ihr Bild verwenden, benachrichtigen Sie bitte den Veranstalter.